Born in 1937, Schnitzler grew up in Düsseldorf after the war. The rebellious art-scene there had a deep impact on Schnitzler, who was not what you would call a success in school. His father tried to give him piano lessons, but only a deep resentment against 'serious music' evolved out of this experience. After finishing school, he was trained as a machinist. Most of his training was done in a big industrial building. The endless hammering, grinding and throbbing of metal on metal left a deep impact on him. Somehow, these sounds were like music to him, especially in the evening, when all the big machines were turned off and an empty silence filled the air. Late at night, Schnitzler listened to the radio. He heard broadcasts about contemporary composers like Karlheinz Stockhausen and John Cage. Schnitzler recognized a fascinating similarity between their music and the sound of the machines in his factory. After finishing his professional education, he left the city and signed on as a sailor for one year. Back in Düsseldorf, he realized he didn't want to be a factory worker. Living off his savings, he became a genuine bohemian. He created tiny tin-sculptures. Full of doubt and insecure in almost all aspects of his life, he applied as a student at the Düsseldorf Academy of Fine Arts in 1959. Unexpectedly, he was admitted to the Academy and registered in the class of Joseph Beuys, who had just become professor there. Beuys had a radically new art approach, saying 'everybody in his own terms, is art, creating a new social society'. This period had a deep impact on Conrad Schnitzler's life. But in the summer 1961, he decided to depart and headed to West Berlin, just a few weeks before the building of the Berlin Wall. He talked about this in a recent interview. "Starting from performances, I finally ended up in the creation of sounds early in 1968. Well, I couldn't play an instrument, but I started with what I had heard about modern music earlier in Düsseldorf." He was mostly working with film material. He scratched and deformed it, so that you hear strange sounds from the soundtrack by projecting it. He showed his films in combination with performances in art galleries. At the same time, Schnitzler was really enthusiastic about psychedelic rock-music and free-jazz. But at this time, the different music scenes were working in total isolation from each other. Schnitzler dreamt about getting them all together in one space. This was the reason why he started the 'Zodiac-Club' in 1968, together with Boris Schaak and Hans-Joachim Roedelius. The Zodiac was the first "underground" club in West Berlin. It was sort of strange, dark, and brooding, almost uncontrollable. It was a place where the word "experiment" was the leading force behind everything. Schnitzler wanted to build bridges between the different movements in art and music. He wanted them to join together and create new possibilities. On the stage of this glass-walled room, the former canteen of a theatre which looked out on the Spree river, everybody ranging from Agitation Free to german free-jazz-pioneer Peter Brötzmann were invited to create and communicate their own vision of experimental music. The room was painted pitch-black, including the windows. Schnitzler went around town, distributing flyers which advertised "noises" with the time and place of the event. Whoever wanted to take part in creating these 'noises' was allowed to take part. Most of the time, Schnitzler shared the stage with known and versatile artists from jazz to rock. These stage acts were statements of non-conventionallsm, based on the pure joy of making music. Sometimes musicians would meet for the first time in their life on stage of the Zodiac. Or maybe two bands would appear on one stage at the same time. They might play together or against each other. For Schnitzler, this anarchistic concept of 'free play' was heading towards his true goal: "If lots of people make noises, it becomes an orchestra... If you do it alone - for example the sound of a stone on linoleum - that's a solo-track. If you play these sounds and record them onto different tracks, it becomes a composition... Make horrible noises with instruments and microphones and echo-machines. Just do it and produce as much noise as you want. If you organize this noise it's not just pure chaos... it can grow into music. This noise-making was meant as a way to express and explore your inner self. It wasn't meant to create music in a traditional way at all. Basically, the idea was to create sounds for communication, to let others experience your own philosophy." Immediately, a scene was growing around Schnitzler, but soon he realized it was too much work to organize the club and go on stage every evening. He quit and began concentrating just on making music. He sold his welding equipment and spent all the money for instruments. He purchased reverb and echo equipment so that he could create "loops": "The music should not be a reference to the normal stuff. No folk-music, no rock-music, no pop, no dance-music, that was the rule." In 1970, "Noises" becomes "Kluster," a band featuring Boris Schaak and Hans-Joachim Roedelius. Their stage act was pure improvisation. They manipulated "loops," stuck microphones on guitars and violins and put these sounds through filters or ring modulators. "If there was ever any sound that we felt had to be altered, then we did alter it in a radical and fundamental way. Without making it a public affair." Strangely enough, they got the chance to publish a commercial record: "I discovered an advertisement in the newspaper from an organist who was interested in new music. Since I knew this guy from the time I lived in Düsseldorf, we went over there and played the tape of a concert we had made to him. A lot of feedback and all those crackling sounds. He said, 'this is good, do you want to do a record?' We said, 'That's OK.'" They prepared themselves well to record in Conrad 'Connie' Plank's Cologne recording studio. "We said we'll do two 20 minute-long pieces; just show us the time in between. So we just played solid and saw nobody." At the same time, Schnitzler was working with Edgar Froese and Klaus Schulze to create 'psychedelic rock-music.' But soon enoughm Froese discovered that he didn't like anarchistic music. Despite his arty background, he wanted to play by the rules of rock music. So there was a lot of tension within the band. "They tried to make nice music I just interfered with. 'You destroyer, you!' Klaus Schulze always shouted." 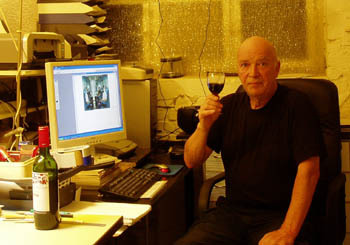 Schnitzler did take part in the recording of the first Tangerine Dream album, Electronic meditation but shortly after that, he was ousted from the band. "We did a tape earlier, when we got some machines and lights, but we were fighting a lot about it, because they were rock musicians. They liked to play this kind of rock music. So all the concepts were running away. Sometimes we did fantastic things, but they were playing against me." Schnitzler was always a radical: he wanted to change and recreate what had become the leading rule. He was always after the unpredictable. Shortly before this concept propelled him out of the musical circles of West Berlin, he organized a collective of musicians, who played under the name "Eruption." Ten musicians, standing around the audience, consequently playing with or against each other. For Schnitzler, this marked the end of it all. No more cooperation with other musicians. From then on, he was on his own, as sound-creator and musical philosopher. As for Kluster, Schnitzler insists that he never really left the band- he just 'grew out of it.' In any case, Kluster was never conceived as a band per se. Schnitzler just changed the name for his stage-shows (from 'Sounds' to 'Kluster' as explained above) and Roedelius and later Dieter Moebius where the two musicians who played with him almost every time. As such, Kluster didn't have any grand plans- they just happened to make music whenever they felt like doing it. Luul Ulbrich of Agitation Free explains that Schnitzler was interested in concepts, not in writing songs. Even so, he was a very strong influence to other musicians at that time- Ulbrich says that he would hanging out at his apartement, always talking about art and music. As for Roedelius and Mobius, they continued on as Cluster (which you should hopefully know about already) while Schnitzler took a different path. In 1972, Christopher Franke (a later member of Tangerine Dream) told him about the "Synthie A." It was the first portable synthesizer for a reasonable prize. "I called all my girlfriends, collected all the debts and travelled to London, to buy me one of these things." By this time, Schnitzler was working in the studio of Michael Baumann on soundscapes: "I went into the studio, carrying nothing with me and Peter said 'Oh, why haven't you brought any stuff? - You can use my Synthi.' He showed me how it works and so we started. Probably since I was only curious about the possibilities of the machines, I started with the echo machine. I used just rhythm machines with echoes and ring modulation. On 'Metall I,' I really freaked out using a harmonizer. Peter showed me how to use it; I did an organ cluster, put it through the harmonizer and it came out like that." Together, they created loops. Each loop was recorded on one tape. Schnitzler brought six orange tape recorders, tied them together with a metal chain and hung this construction around his body. The tape recorders were connected to an amplifier and a loudspeaker that was screwed on a helmet. Wearing this outfit, Schnitzler could walk around and perform as a 'one-man-band' in art-galleries. Sometimes only one track could be heard, but sometimes he turned all the tapes on at once: "I give every cassette the same chance, in turning up the volume on the same level." Often, he performs on the streets/sidewalk: "I had kids, and I had only one job as a janitor, so I had to think about earning a living by making music. I took my bicycle, and drove to the Kurfürstendamm. Right in front of the Cafe Kranzler, I started to turn on the tape-recorders. Then I strolled up and down the Kurfürstendamm. People were coming after me and I said 'Whoever likes this can give me some money.' Well, the best thing was that people even wanted to buy tapes! After one hour and a half, I jumped back on my bike and had 50 marks in my pocket." Since the beginning of the nineties, he has been working with CD players. But today, sometimes his musical minimalism can grow into symphonic dimensions: "Of course these concerts can be done with a lot more single-track CD's, it depends on the performers intention as well as the capacity of the mixing-desk. It's no problem to work with 12 or 14 CD-players if you're used to it. Often, I did these performances in connection with a kind of lightshow, with videos or effects. But usually there's only the performer, his CD players and the mixing-desk on a nearly dark stage - nothing more." Even today his working-methods haven't changed a bit. Each detail adds to one another and leads to the final effect. Beginning from the early seventies, you can find the link between Minimal Techno and Industrial Music in Schnitzler's Oeuvre: "I do music how it comes, more like a direct happening - like catching something I know I want to do. Minimalism has always been part of it. The reduction to the essence of noises/sound. I've always worked like that until today, on a very personal level. No Schlager (popular ballads), no program music, no music to any kind of use, not for the church, not to dance to, not to chill out to. Over the years, I've developed my very own style of creation with sounds. If I don't do music, I do something else: texts, films, performance - whatever I want." Currently, Schnitzler has recorded over 30 albums. Some of them are in limited editions of only 100. His latest recording has the title Klavierhelm ('piano helmet') and was released by Important Records in 2006. This time he played piano, an instrument his music is rarely associated with. It's a surprise to hear how his vision of the 'pure sound' works here. It alternates in between John Cage and Cecil Taylor. His sound-vision truly resemblances that of Cage. Sound is the basic essence of music- even the sound of silence. What would have become of 'Krautrock' if people like Froese, Schulze or Göttsching followed the example of Konrad Schnitzler? Minimal Tribal Music? Free Noise?